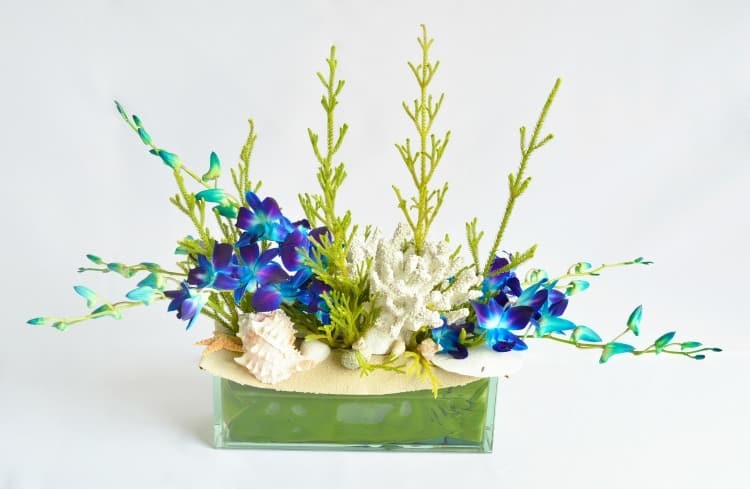 Are you looking for the perfect beach wedding centerpieces? 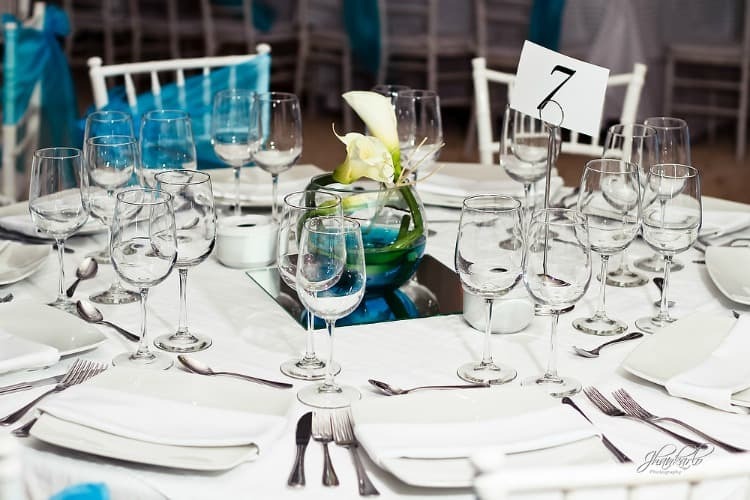 Your table decorations are a great way to tie your theme and style together. And because there will be so many of them, they’re a great way to get that wow effect! In this post, I’ll share pictures of amazing arrangements that will do just that! And I’ll also share some tips that are very unique to beach weddings. 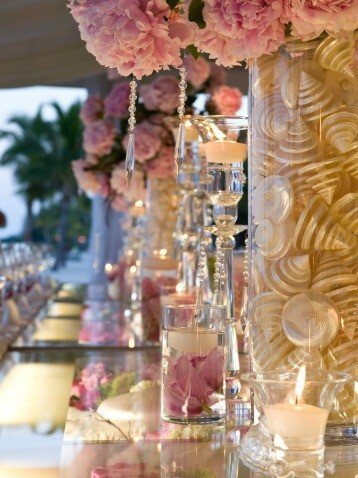 Many brides wonder how they can incorporate their seaside theme without overdoing it and looking tacky. As soon as I saw these arrangements, I thought they were great examples of understated, subtle but beautiful ways to do just that. 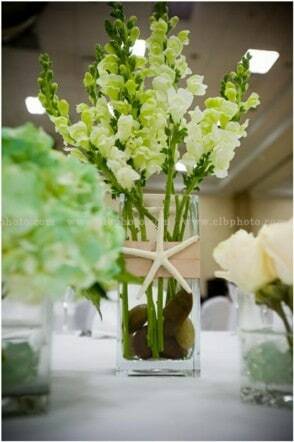 When most people think of beach themed wedding centerpieces, they envision sand, seashells and starfish. But that’s not the only way to capture the spirit of the tropics. 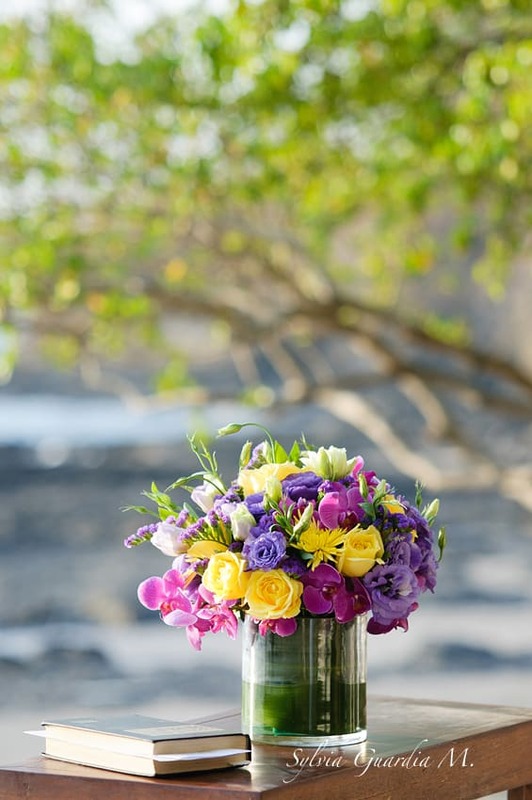 Exotic flowers in bold colors or even more simple and elegant flowers that can withstand the heat and sun can all be awesome options! 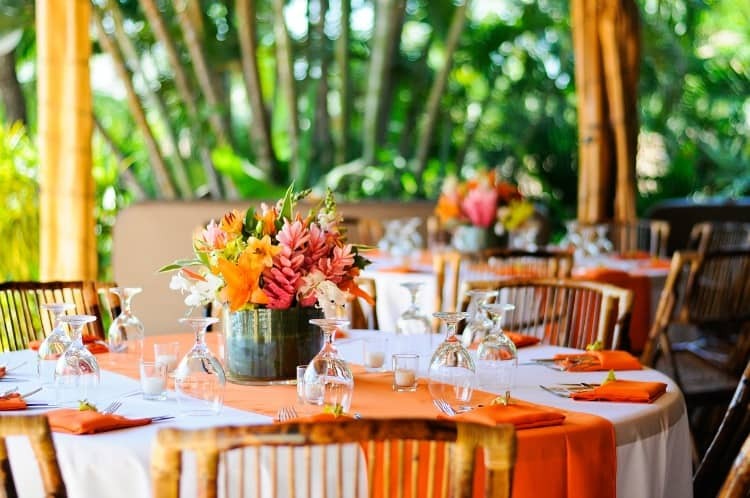 Instead of choosing arrangements that just blend in with your backdrop, enhance the natural beauty of your surroundings with colorful, exotic arrangements that pop and will look absolutely stunning in pictures. 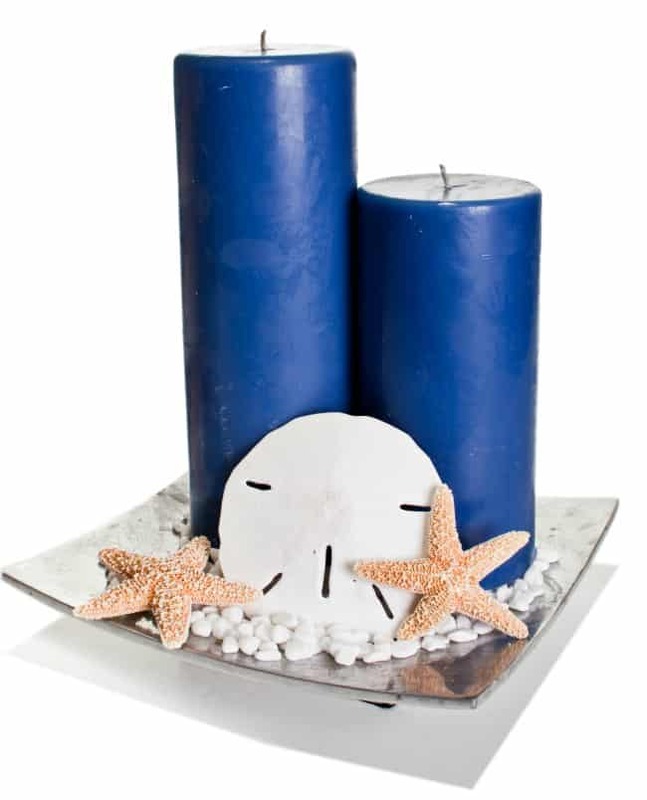 Just the act of getting married by the ocean is romantic in and of itself, but if you want to take the ambiance to the next level, there’s no better way than with some candlelit beach theme wedding centerpieces. Just the thought makes my heart flutter! It’s such a simple, inexpensive and beautiful touch to any décor. 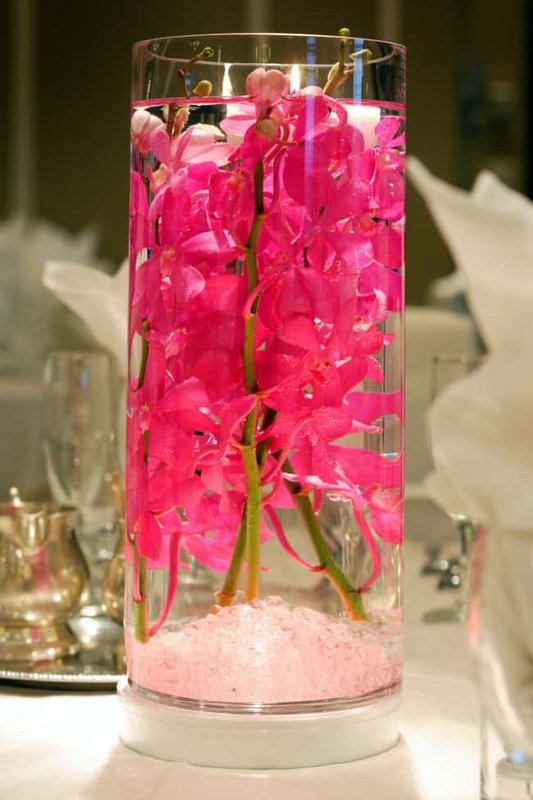 A great way to prevent the flames from going out with the wind is putting floating candles in tall cylinder vases. It will give your tables a sleek, modern and stylish look. Just make sure the candles float somewhere in the middle to prevent the wind from blowing them out. 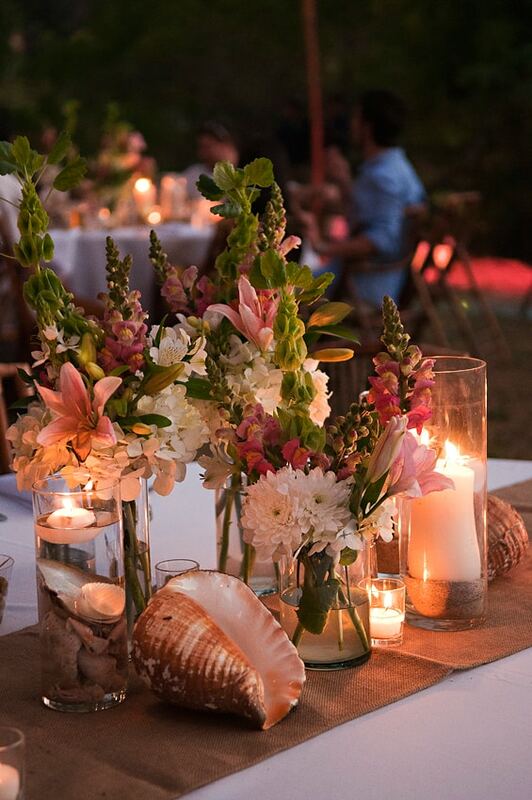 How about combining candles and flowers in your beach wedding centerpieces? I absolutely love, love, love this next table arrangement. It is elegant, romantic and beachy all in one. I’m rarely at a loss for words, but the photo of this arrangement speaks a thousand words so there’s not much more I can say about it! White themed ceremonies are a popular and growing trend which I personally love because they just look so romantic, simple and laid back! 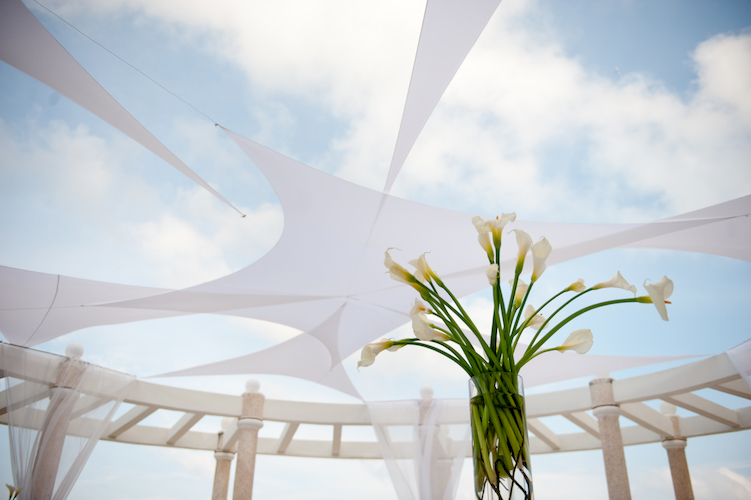 One of the most popular flowers for beach wedding bouquets and centerpieces is the calla lily. The most popular variety is white, but because the stems are so thick and bright green you can rest assured that they won’t look boring or washed out. On the contrary, callas can look absolutely stunning depending on the arrangement. 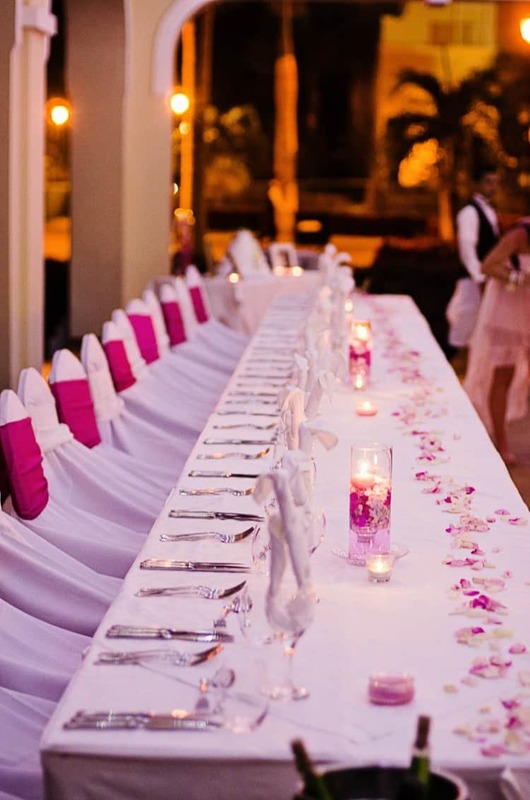 Because of the intimate nature of most destination weddings, many brides choose to have one long rectangular table instead of multiple round ones. Long tables give you that sense of family and really encourage conversation. 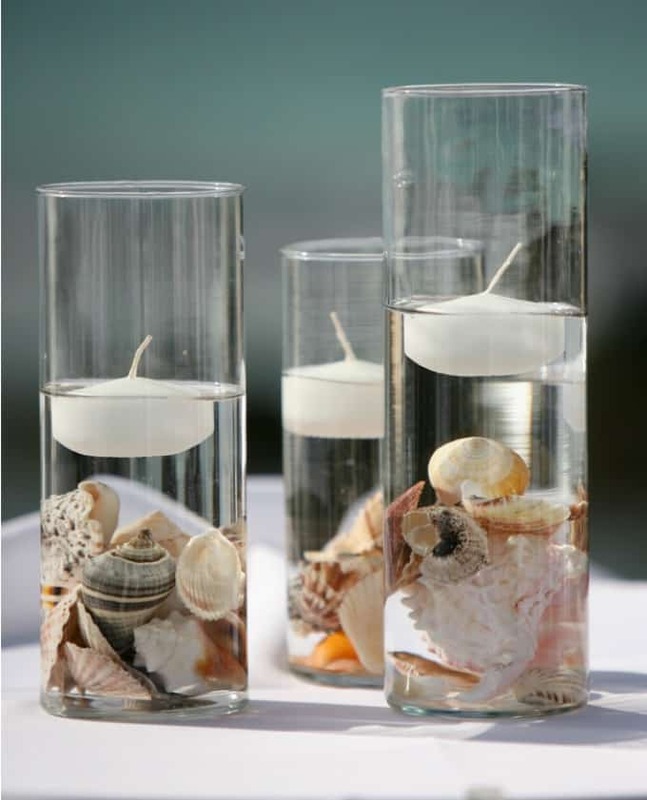 Here are some beach wedding centerpiece ideas for long tables. 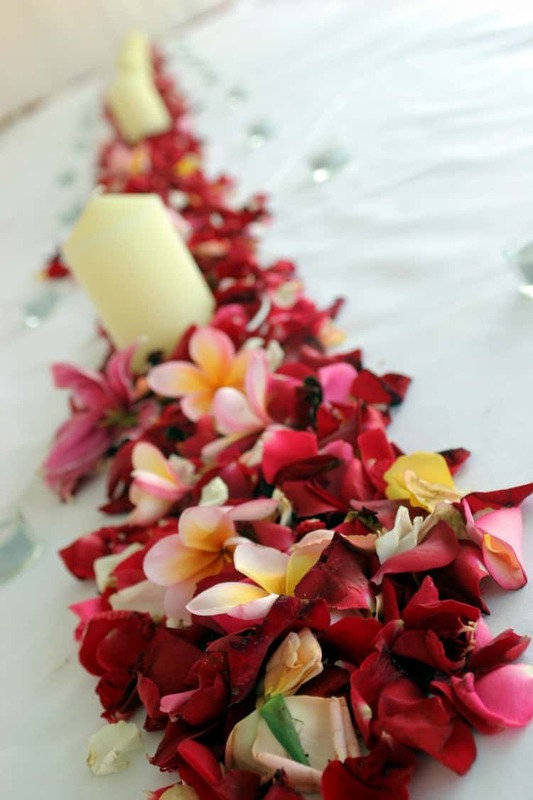 Some flowers like Orchids, like it hot which is obviously perfect if you’re getting married in the Caribbean or a warm location. But on the other side of the coin, there are some blooms that hate the heat and thrive in the cold weather. Those are the flowers you should avoid using. Talk to your florist about the best options so that your gorgeous and expensive blooms don’t wither before you even get to the first dance. 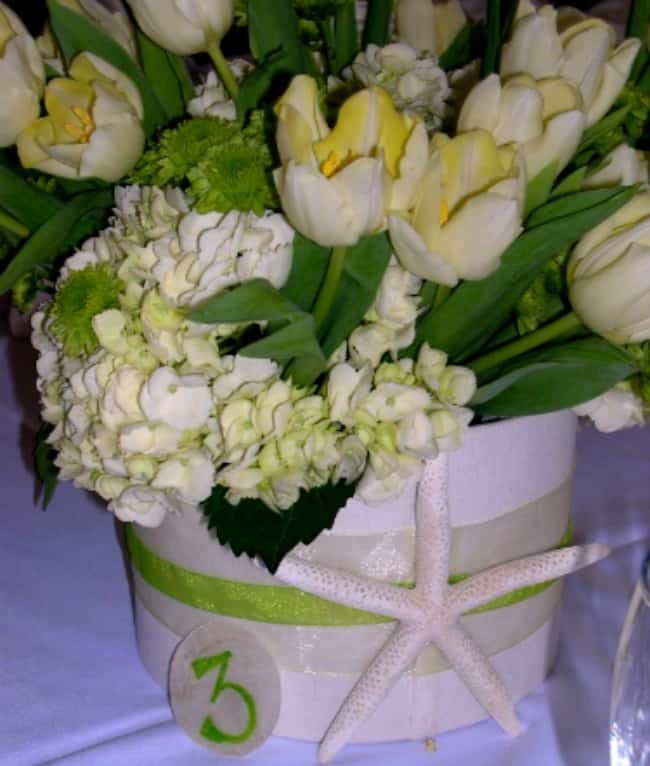 Are tall or short arrangements better for beach wedding centerpieces? Short arrangements are the most popular. 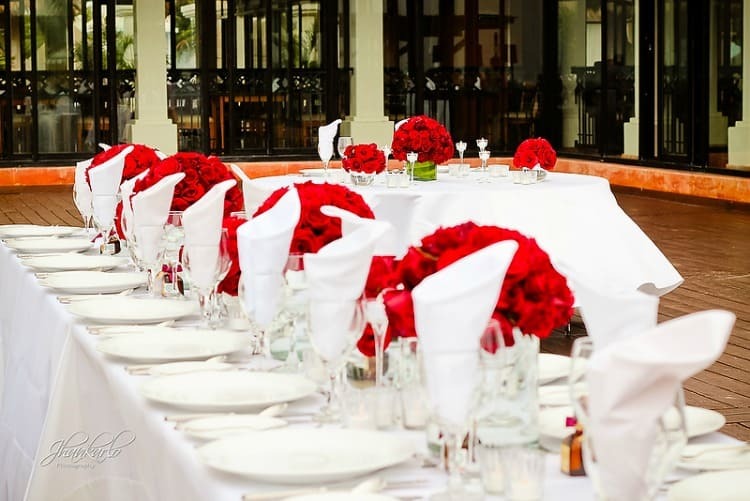 Some destination brides avoid tall arrangements because of the fear that the wind will topple them over. And it’s a very valid concern. But if you are just in love with the idea of a tall arrangement there are ways to pull it off. I was one of those brides that had tall, dramatic arrangements on my reception tables. If you want to go that route just make sure that the vase is very sturdy, heavy and full of water to hold it down. I even added some rocks which doubled as decorations and added weight to the vase. 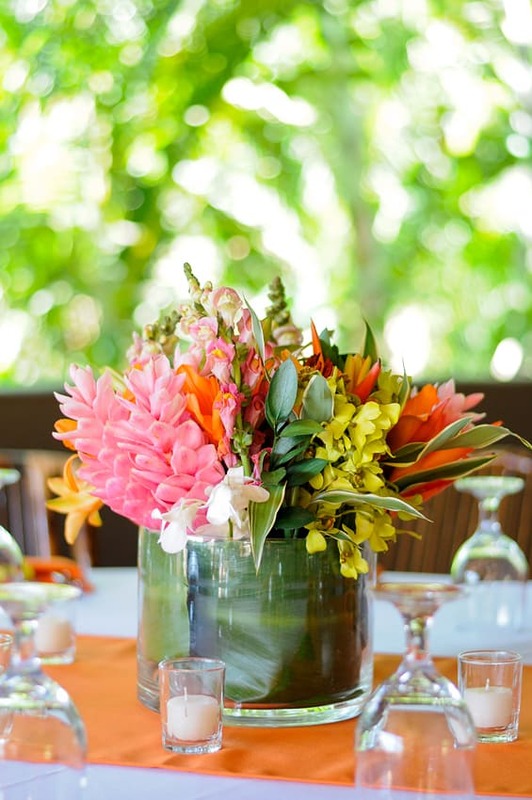 You can also mix & match tall and short centerpieces like the gorgeous arrangements featured in this real wedding. You can go tall but avoid arrangements so tall and elaborate that they’ll block the amazing view nature provided. After all, if you’re tying the knot by the ocean, you should try to enjoy the view as much as possible. Although they can be incredibly romantic, candles won’t last in a windy location. You’ll have to put them inside a hurricane vase or other candle holder. Floating candles in tall cylinder vases are a great option. Another idea is to use flameless candles which can look just as pretty.